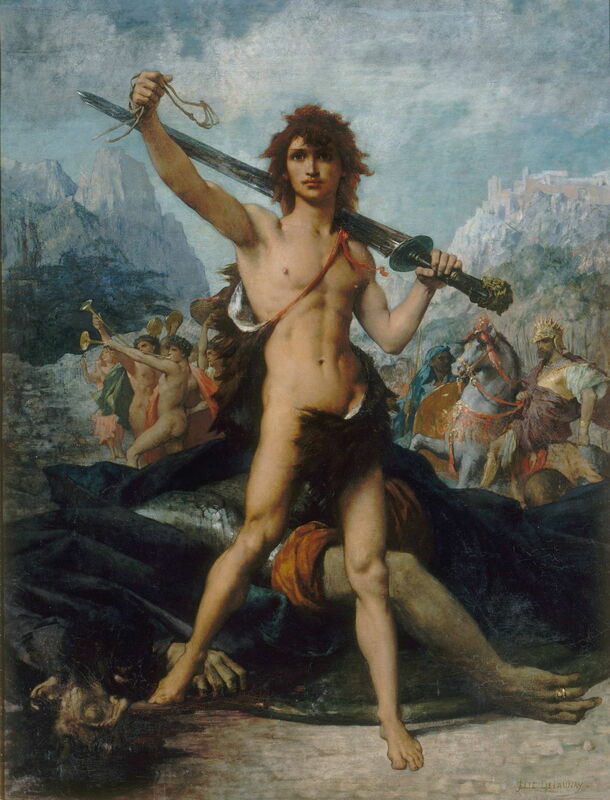 Jules-Élie Delaunay (1828-1891), David Triumphant (1874), oil on canvas, 147 x 114 cm, Musée des Beaux-Arts de Nantes, Nantes, France. Wikimedia Commons. There were many history painters in France during the latter half of the nineteenth century, of whom Gustave Moreau and Jean-Léon Gérôme were but two of the more prolific, famous, and contrasting. Moreau had two close friends who were highly-rated history painters, whose early deaths affected him deeply: Théodore Chassériau, and Élie Delaunay. This article looks at some of the latter’s history paintings. Jules-Élie Delaunay (1828-1891) was born in Nantes, France, whose Art Museum now holds the largest collection of his work. Educated at an elite local school, his talents were spotted by Joachim Sotta, a local artist, who taught him initially. In 1846 Delaunay was introduced to Hippolyte Flandrin, who had been Ingres’ favourite student, and two years later enrolled in his workshop at the École des Beaux-Arts in Paris. He first competed for the prestigious Prix de Rome in 1852, but was unsuccessful. He tried again over successive years, but it was not until 1856 that he was awarded the prize jointly with Félix Auguste Clément. He then moved to the French Academy in Rome in January 1857, travelling in northern Italy during the following summer. While he was in Rome, Delaunay met and befriended Degas, Bonnat, and Moreau. Jules-Élie Delaunay (1828-1891), Caesar and His Fortune (Caesar in the Boat) (1855), oil on canvas, 114 x 146.5 cm, Musée des Beaux-Arts de Nantes, Nantes, France. Image by VladoubidoOo, via Wikimedia Commons. Caesar and His Fortune, also known as Caesar in the Boat was his unsuccessful entry for the Prix de Rome in 1855. This shows an episode from the civil war fought between Julius Caesar and Pompey in 49 BCE. When Caesar had famously crossed the Rubicon and driven Pompey from Italy, he then tried to cross the straits of Brindisi in disguise as a slave, in his pursuit of Pompey, who had fled to Greece. 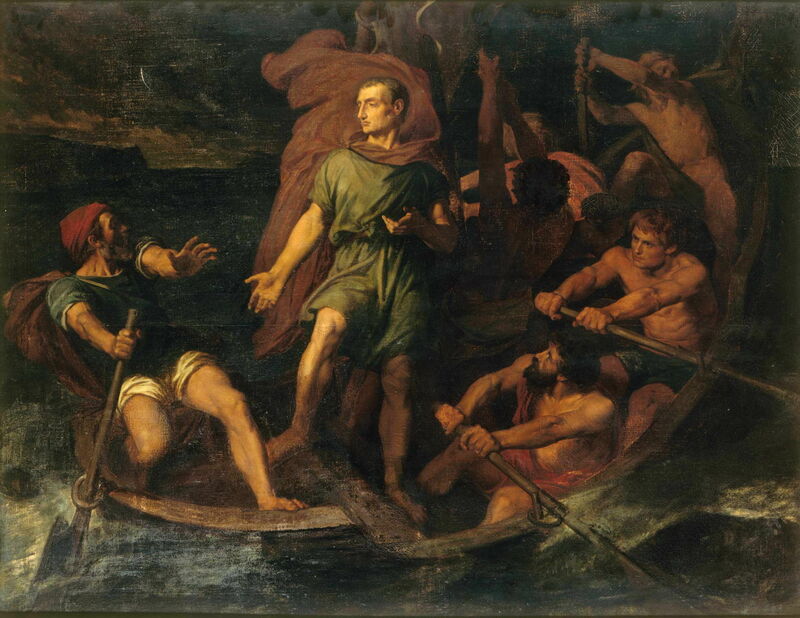 However, Caesar’s boat was caught in a storm, and forced to turn back, as shown here. Caesar stands, looking quite unlike a slave, in the small boat, as its oarsmen struggle to make headway in the mounting sea. He then made the famous remark, quoted by Plutarch (Lives, volume 2): Fear not, you are carrying Caesar and his fortune. 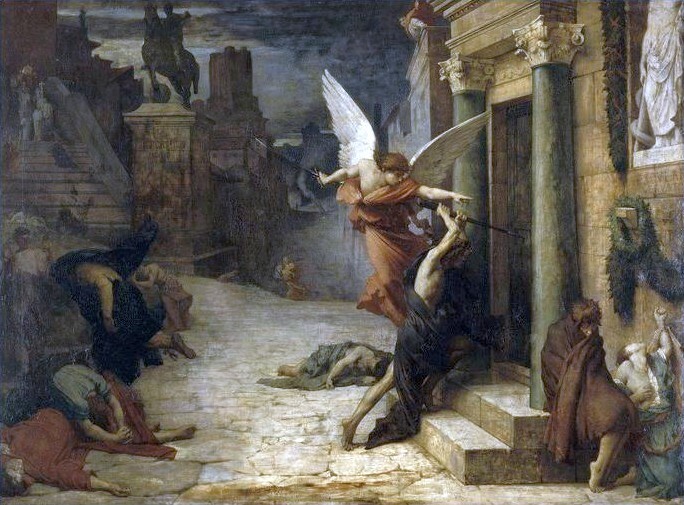 Delaunay returned to Paris after travelling in 1860-61, after which he started to make studies for The Plague of Rome (below). The following year he visited London. He was then commissioned to paint murals in the foyer of the Paris Opera, and Chapel of the Virgin in the Church of the Holy Trinity in Paris. 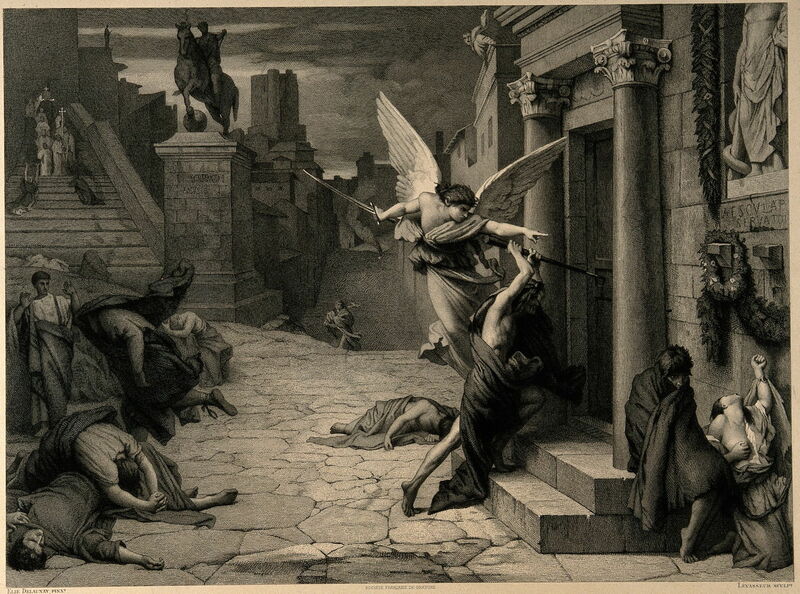 The Plague of Rome (1869) is based on an episode reported in The Golden Legend, a mediaeval compilation by Jacques de Voragine, in which plague was raging in Rome. A pair of angels were claimed to have appeared, one good, the other bad. The good angel then gave the commands for people to die of the plague, and the bad angel carried the commands out. At the right edge of the canvas, the white statue appropriately shows Aesculapius or Asclepius, the god of medicine. It is thought that Delaunay based this painting on a fresco in the basilica of San Pietro in Vincoli, which shows the plague in Rome in 1476. It was quickly popularised following exhibition of the painting in the Salon du Palais de l’Industrie in Paris, in the print below, and Delaunay’s painting was bought by Napoleon III for the public collection. The Death of Nessus (1870) is perhaps the best of Delaunay’s history paintings, discussed here. Sadly I cannot show it here, but it is to be seen via this link. Jules-Élie Delaunay (1828-1891), Diana (1872), oil on canvas, 146.5 x 94 cm, Musée d’Orsay, Paris. Image by Rama, via Wikimedia Commons. Delaunay’s full-length portrait of Diana (1872) shows the Roman maiden goddess of the hunt, moon, and nature in her full glory (this image being much darker than the painting itself). David Triumphant (1874) tells the well-known Old Testament story of David and Goliath, moments after the young and slight hero David has felled the Philistine giant Goliath, who had been troubling the Israelites under King Saul. The rather androgynous, almost elfin, figure of David holds aloft the slingshot which he used to topple Goliath, and carries over his left shoulder the huge sword, still bloodied, with which he then beheaded him. This painting attracted considerable attention when it was exhibited in the Salon of 1874. Jules-Élie Delaunay (1828-1891), Ixion Plunged into Hades (1876), oil on canvas, 114 x 147 cm, Musée des Beaux-Arts de Nantes, Nantes, France. Wikimedia Commons. 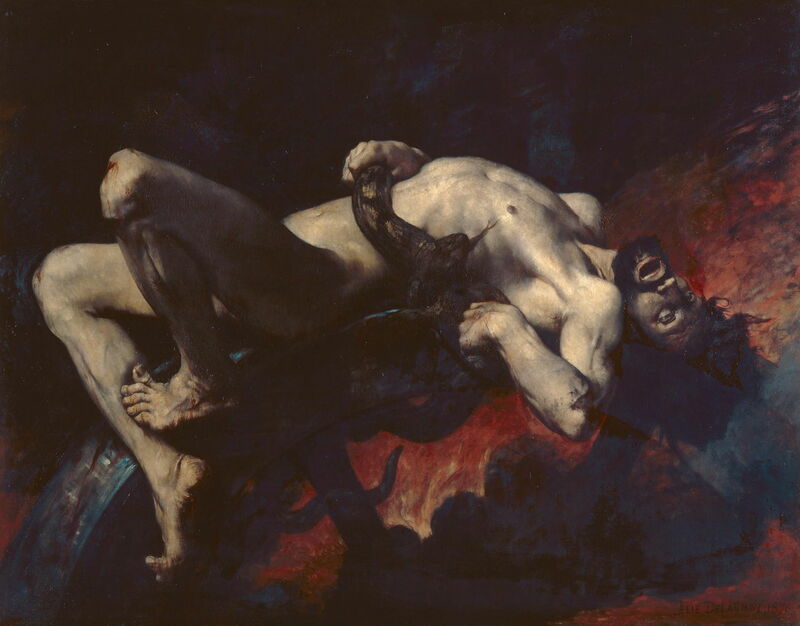 Ixion Plunged into Hades (1876) shows Ixion writhing in agony in the Underworld, as he is bound to a wheel by snakes. Ixion was the son of the King of the Lapiths in Thessaly. He had murdered his father-in-law Deioneus by pushing him into a bed of burning coals and wood, which resulted in Ixion going mad. Zeus showed pity on him, and brought him to Olympus, where he promptly lusted after Hera, Zeus’s wife. When Zeus found out, Ixion was expelled from Olympus, and Zeus instructed Hermes to bind Ixion to a winged fiery wheel and send it spinning across the heavens. The snakes were added to his punishment in later versions of this myth. Jules-Élie Delaunay (1828-1891), Ophelia (1882), oil on canvas, 61 × 43 cm, Musée des Beaux-Arts de Bordeaux, Bordeaux, France. Wikimedia Commons. 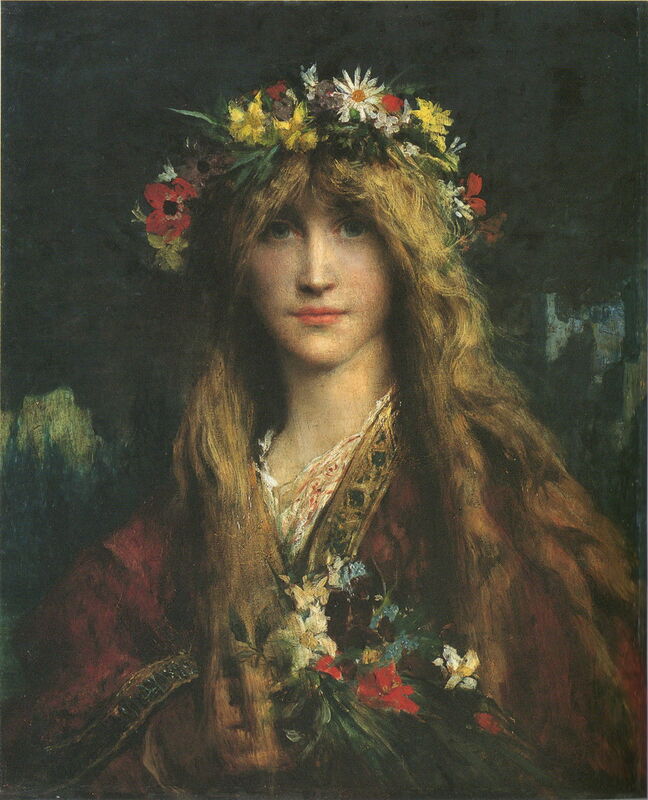 Ophelia (1882) shows the tragic heroine from Shakespeare’s play Hamlet, who has been a favourite subject for painting, particularly during the nineteenth century. In 1883, he travelled to Normandy, Jersey, and Switzerland, and started to teach at the École des Beaux-Arts in Paris. 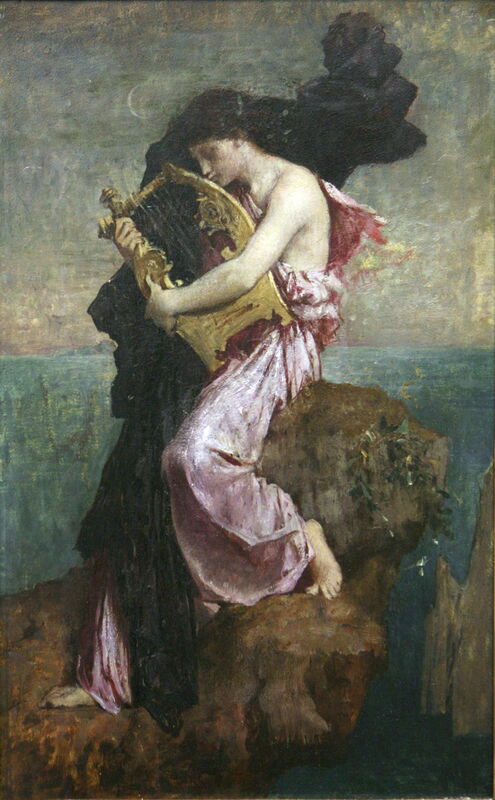 Jules-Élie Delaunay (1828-1891), Sappho Embracing her Lyre (date not known), further details not known. Image by Rama, via Wikimedia Commons. Sappho Embracing her Lyre (date not known) shows the classical Greek poet Sappho, holding her lyre close, as if it were her lover. She is seen at the top of the Leucadian cliff, where she is traditionally said to have killed herself after falling in love with a ferryman. Delaunay painted at least two different works featuring Sappho, who was also a recurrent theme in Moreau’s paintings. Delaunay also painted major religious works, and during the 1870s was a successful portraitist. In 1889, he was appointed director of one of the three official workshops of the École des Beaux-Arts in Paris, bringing him a major commitment to teaching his students there. He won the grand prize at the Exposition Universelle in Paris. His health then started to deteriorate, and on 5 September 1891, he died in Paris. As one of his close friends, Gustave Moreau was an executor of his will. With almost three thousand of his works (mainly drawings), the Musée de Beaux-Arts de Nantes holds the largest collection of Delaunay’s work. Although these have now been digitised, access to them is still very limited. Musée de Beaux-Arts de Nantes (English, also available in French). Posted in General, Painting and tagged Delaunay, Moreau, narrative, painting. Bookmark the permalink.